The British people should be thankful that at least there is an institution standing up for the basic right of citizens to breathe clean air. 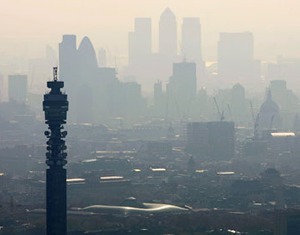 As if the need for international cooperation regarding the effects of humanity on the environment were not obvious, Britain today received a second and final warning from the European Union and faces a £300m fine should it continue to flaunt air-quality standards in many areas of the country, particularly London. The capital is one of the most polluted cities in Europe and the fine highlights once again that successive British governments have continued to do too little to move Britain towards a future of clean energy. The Commission noted that the UK had failed to present “a credible and workable plan for meeting air-quality standards within five years of the original deadline ”. Indeed, whilst many cities in the UK are only set to achieve these acceptable levels by 2020, London is not set to meet them until 2025, fifteen years later than the original deadline. According to the Telegraph, air pollution already kills between 24,000 and 36,000 people a year. Those affected tend to be the young, as nitrogen dioxide – the gas that worries the authorities, mainly emitted by traffic fumes and from power stations – stops sufficient development of the lungs and causes respiratory problems. The commission added that “Nitrogen dioxide is the main precursor for ground-level ozone, causing major respiratory problems and leading to premature death…city-dwellers are particularly exposed, as most nitrogen dioxide originates in traffic fumes”. It is increasingly evident that continuing to cut corners and failing to invest in cleaner energy represents a huge false economy. Last year, EU environment commissioner Janez Potocnik claimed that air pollution was the biggest cause of premature death in Europe and costs the continent £277 billion to £789 billion a year in extra health costs. Even if you do subscribe to a barmy view, running contrary to the findings of nearly all of the scientific community, that human kind has had no effect on the warming of the planet, cases such as this show that the argument for moving to a cleaner, more sustainable future is not diminished. EU air quality measures also prompted a move by the Highways Agency last week to change the speed limit on parts of the M3 and M1 to change to 60mph during peak times to lower pollution. A grievance often levelled at Brussels is its negative impact on British business, smothering the country’s economic growth under a blanket of regulation, but one wonders what exactly the UK government would have been doing to reduce air-pollution and invest in cleaner energy were it not for European compunction. The coalition has already shown that it is willing to sacrifice green levies on gas companies in order to reduce costs for consumers and businesses. It continues to subsidise fossil fuels by giving huge tax breaks to oil and gas corporations, and has recently taken a cowardly step down on the issue of onshore wind farms in fear of upsetting its NIMBY core vote.